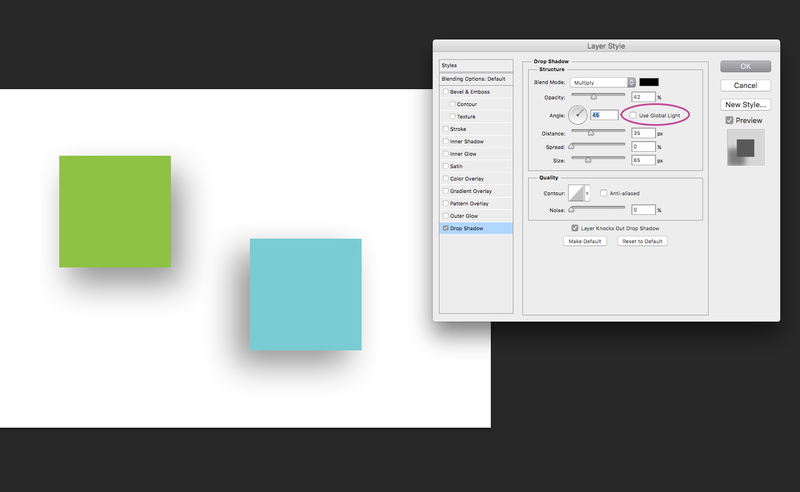 I am wondering how to have 2 different directional drop shadows in the one file with Photoshop. e.g. 2 different type layers — one has a drop shadow at 90 degrees, the other at -45 degrees. Currently it seems Photoshop only lets me have 1 universal direction for the whole file, which I find really pointless. I know how to apply different drop shadows and merge down layers to achieve the same thing, but its tedious and not exactly streamlined for making future changes to that layer. When you are setting the drop shadow effect on an layer, uncheck the "Use Global Light" checkbox. 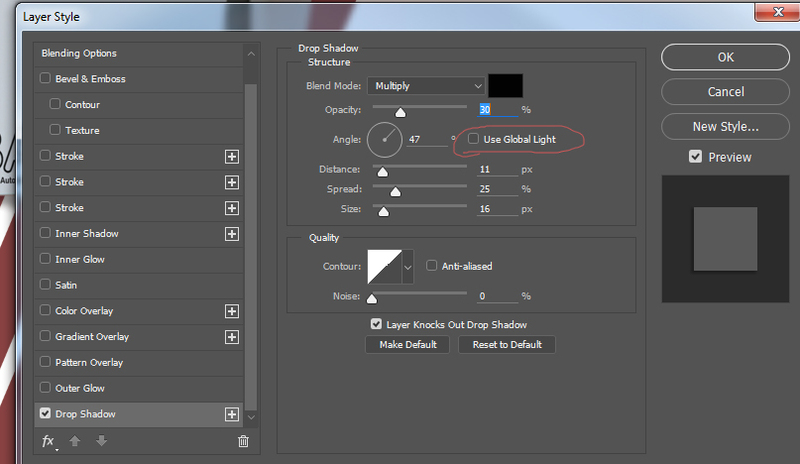 Uncheck the "Use Global Light" checkbox in the Drop Shadow dialog. If it's checked, then any change you make will be reflected in any other drop shadow, bevel and emboss, satin, etc. that has it checked. When you apply effects that have a light source, you have the option of using a global light source. That global light source is always the same for all layers. You can edit the global light source indepentantly of your layers by going to Layer → Layer Style → Global Light. If you don't want to use the global light source simply uncheck Use Global Light in the effect. If you have plenty of layers and these two types of shadow you could manage it with smart objects, each object has its own global shadow setting. Help on Resizing a Photoshop document w/layers for print! Why does my PSD file contain only one layer after saving a project from Photoshop?